Alabama Debt Collection Lawsuit Questions — Part One — What Is The Lawsuit Filed Against You? SUED IN ALABAMA BY A DEBT BUYER OR DEBT COLLECTOR? This is part one and we will link to the other parts when we get them up on this website. (This is from a book we have and shortly we will make the entire book available for consumers in Alabama). So let’s get into this right now . . . .
My name is John Watts. I’m a consumer protection lawyer in the State of Alabama, and you’re in the right place if you are looking for answers because you have been sued in Alabama by a debt buyer or a debt collector. Let me just describe some of the dangers that you face right now. You’ve been sued. A huge percentage of people allow a default judgment to happen against them. Now whatever type of judgment, a default judgment or if you lose the case, then you face a danger of wage garnishment. That can be 25 percent of your wages. Or bank garnishment, where your entire bank account is wiped out. Having a judgment can destroy your credit report. And you can even lose your car, or your home to what’s called a sheriff’s sale. On top of all that, there’s all this fake information out there about what debt collectors can do. What they cannot do. What your options are. And so that’s why we created this book. We need to go through a ton of questions, provide very practical answers, so that you can decide what to do. And really, this is the purpose of the book. We want you to know what your options are. And we want to encourage you to take massive action right now, because if you just know what to do, well that’s not enough. And if you just take action without knowing what to do, you’re not going to get a good result. You need knowledge plus action to have real consumer power. So who in the world is John Watts and why should you be listening to me? Why should you take your time with this? I’ve been a lawyer since 1995 and for about the first 11 years or so, I knew nothing about collection lawsuits – about debt buyers, the Midland Fundings of the world, Portfolio Recoveries of the world. I just had no dealings with those guys. I did almost exclusively personal injury and fraud cases and this was just foreign to me. But in the last about 11 years, I’ve represented hundreds of consumers who have been sued by debt buyers. I’ve lost track of how many consumers I’ve helped to handle their cases on their own. And that is a real option for a lot of people. I’ve trained lawyers in Alabama and lawyers in other states about this. If you want more information, you can go to www.AlabamaConsumer.com to read articles or you can go to our YouTube channel at www.JohnWattsVideos.com. You can find just tons of information about this subject that I’ve created. So I hope that gives you some comfort to know that maybe at least in some small way that I know what I’m talking about. And I’m confident you will find it worth your time to read this book. So let me give you this disclaimer. I’m a lawyer, so I need to give you this disclaimer. I think you know all of this, but let me just go through this quickly. I’m not your lawyer, unless you hire me. I’m not giving you legal advice. This is background information. And look, everything we talk about, there will be exceptions, and even exceptions to the exceptions. I’m not covering those. I’m covering the high points here. And certainly, there are lawyers, particularly collection lawyers and even judges that may disagree with what I say. And you have to make your own decisions about what to do. The purpose of this is to get you started and help you think through your situations, so you can evaluate your five options. We’ll cover those in detail. What do you do next? And this is only for Alabama. I don’t know how other lawsuits work in other states. This is for Alabama. If you’re in another state, get with a lawyer in your state to find out. This is the best advice I can give you — get with a lawyer in your state who knows what he or she is doing. And then they can give you specific legal advice for your situation. And to the extent this is considered advertisement, here’s a disclaimer required by Alabama. No representation is made that the quality of legal services performed is greater than the quality of legal services performed by other lawyers. We’re going to start off with lawsuits in general. And a lot of background questions about what are these debt buyers or these debt collectors. Then we’ll talk about being served. Next, we’ll talk about your five options. Then we’ll focus on okay, how do you get an answer filed in your case. And then what happens before a trial. What happens during a trial. Related to trial, we have some general information but then also specifics on the three types of courts that we have: small claims, district and circuit. Then what happens after a trial in each type of court. And then we’ll close with what I hope is a very practical thing and that is – okay, you’ve gone through all this book, all this information. What do you do right now? READY? LET’S GET STARTED AND THANKS FOR JOINING ME ON THIS JOURNEY! So let’s get started, and I appreciate you joining me on this journey. If you have questions, you can always reach us at 205-879-2447. Our first section is going to be what is this lawsuit filed against me? What does being sued actually mean? Well, it means that somebody has gone into court and has filed a lawsuit or a complaint against you saying that you violated some law. You broke a contract. You did something and now you owe them money. So in a nutshell, that’s what being sued means in Alabama. Now, here are some background questions, because these often come up in people’s minds. No. At least it’s not 100 percent true that nobody can ever buy a debt. Now, there may be some situations where it would not be legal to buy debt, but when we’re talking about credit card debt, car loan debt, student loan debt, mortgage debt, all that type of stuff. Yes. That is legal to purchase in Alabama. So it is okay. It is proper for that to be bought in Alabama assuming all the rules are followed. And so I want you to know that it is possible for a debt collector (or what’s known as a debt buyer) to actually buy debt in Alabama. Well, the answer is, assuming all the rules are followed, it is legal. It is proper for a debt collector to sue you in Alabama. Again, assuming they follow all the rules. They follow the federal rules. They follow Alabama court rules. Alabama law. There are a lot of places where these debt collectors or debt buyers violate the law. But it is possible that they can sue you in Alabama and do so legally. A charge-off is an accounting function. And it doesn’t have anything to do with whether or not you owe the debt. And so the answer to this question is, yes, you can be sued on a charged off debt. Let me just be more blunt. Basically, every single debt collection lawsuit is on charged off debt in Alabama. You can be sued on charged off debt. A final sort of background question. Well, let’s take that in a couple steps. The first part is, absolutely these debt collectors violate the law very often. But the question is, in your case, did the debt collector follow the law or violate the law? Let’s take a very common debt buyer, Midland Funding. So we’ve got Midland Funding in the court, and we have you in the court. The judge is not going to be looking at, “I wonder what happened in other cases with Midland Funding.” Or, “Do other debt buyers violate the law?” The answer is yes, they do. Yes, Midland Funding violates the law, but the question is in your particular trial, the judge is only going to be concerned about the evidence between you and Midland Funding. Not in some other case. So to answer this question, no, it is not true the judges will somehow ban or prohibit these lawsuits, because we’re dealing with a bunch of abusive debt collectors. We are dealing with generally abusive debt collectors, but they have the right to sue you as long as they follow the law in your particular case. It is simply the document that starts the lawsuit. It’ll have your name on it. It will have the debt collector, the debt buyer’s name on there. And hopefully, it will have some information about what is this lawsuit is all about. What’s the underlying debt? How much do they claim you owe? Now, a lot of times these have very little information. Sometimes they have quite a bit of information, but this is the starting point of any lawsuit. The statute of limitations is a somewhat controversial subject in Alabama when we’re dealing with debt collection lawsuits. Let me give you kind of the big picture. The statute of limitations is the time period the creditor or collector has to sue you. Clearly, there are some types of cases where it is a three-year statute of limitation. Then there are some types where it is a six-year statute of limitation. And then some, it’s a four-year statute of limitation. Let me give you a little more detail. Those of us on the consumer side argue that credit card type lawsuits are a three-year statute of limitations. Now the collection lawyer will say it is six years. Thankfully some judges go our way, but some go the other. There is no absolute clear authority from the Alabama Supreme Court if we are being generous to the debt collectors. I do believe it is three years. But we have to acknowledge there is a chance that a judge could say it is six years. You see, normally the six-year statute of limitation is for normal types of contracts. You take out a personal loan, it will normally give the creditor six years to sue you from when you break (breach) the contract. Now, if we’re dealing with an old car loan, then we have to get into a little bit of detail. Did you go get that money from a bank? So here’s one way you get a car loan. You go to the bank. You go to the credit union and they say, “Alright. You’re approved of $20,000.” You go down to the dealership. You buy the car. The bank pays the car. And then you pay the bank. Well, that is most likely six years. But what if you go to a dealership and you agree on $20,000? Dealership says, “I’ll get you the credit.” And then when you look at the sales agreement, it says the dealer is the seller and the creditor. Now, they may very quickly assign that to a Citi Auto or a Capital One Auto or somebody like that. And then it may get assigned or sold down the road to companies like Santander, Cascade Capital, Velocity. At least those companies claim that they buy it. In this situation, we’re normally looking at a four-year statute of limitation. So bottom line is, this is not always the easiest thing to figure out. And my suggestion is, get with a lawyer. Presumably, if you’re reading this, you live in Alabama. Just get with us and we’ll help you figure it out in your particular case what is the statute of limitations. 205-879-2447 and ask for Carolyn. The answer is yes. Maybe the statute of limitations has expired, which means it’s too late for the debt collector to sue you. But even more than that, we have beat I can’t tell you how many of these debt buyers in hundreds and hundreds of lawsuits, because they cannot prove they own the debt. So you absolutely have a chance to beat these guys in the lawsuit. And that’s why it’s such a shame when people just do nothing. And they let a default judgment be entered against them when they could have beat this debt buyer or a debt collector. Well, because they claim – very important that we focus on that word “claim”. They claim, they allege that they have bought the debt. Now, if that’s true, then they are a “debt buyer” because they have bought this old debt. And then when they buy the debt, then they sue you. So that’s the theory of this industry anyway. But often they cannot prove they bought the debt. They cannot prove they own the debt. This gives you a great opportunity and it is a huge problem for these debt buyers/debt collectors who are suing you. We don’t send people to jail because we owe money. If you lose the lawsuit, then you will owe money. And there are things that can happen if you owe money such as wage garnishment, bank garnishment, seizure of your property, etc. But going to jail is not the natural consequence of losing a debt collection lawsuit. A judgment is when a court issues an order, and it decides or it judges between the two parties. So say it is Portfolio Recovery Associates who has sued you. If there is a judgment, that judgment says who won and who lost. So the judgment is just the final ruling by the court. If you the consumer loses, then that’s how much you owe this debt buyer. If the debt buyer loses, then you do not owe the debt buyer any money. (We’ll cover this in great detail when we get to the section on what happens after a trial). The word itself gives us a hint as to what this means. If we default, it’s we don’t show up. We don’t put up a fight. We just lose. So imagine the Iron Bowl in Alabama. And whoever your team is, and you’re confident your team is going to win, but they do not show up to the game. The other team wins the game because your team defaulted. So a default judgment in a lawsuit context is, maybe we do not respond to the lawsuit and so we have defaulted. There are certain time limits involved. Or maybe we have responded, but we don’t show up to trial. And then the court can say you have defaulted and enters a “default judgment” against you. So that’s what a default judgment is. Obviously, you want to avoid this like the plague. This is the classic way these debt collectors have to collect on that judgment, or sometimes what’s called “execute” on that judgment is to garnish your wages. The basic rule is about 25 percent of your take-home pay. So whatever your paycheck is every week, every two weeks, once a month, divide that by four, and you lose 1/4 of that. So if your wages are $4,000 a month, your paycheck, well, you’d lose about a $1,000 to wage garnishment. If you get $1,000 every two weeks, you may lose $250 a paycheck to wage garnishment. So obviously very devastating for you to lose 25% or a quarter of your take-home pay. For most consumers in Alabama, it is not possible to continue to pay your bills – rent, mortgage, health insurance, etc. when someone takes ¼ of your income every paycheck. Now, there are some exemptions, if we have social security type money in there. But just understand if the collector gets a judgment against you, and I don’t care if it’s a default judgment or a judgment after a trial, your bank account is at risk of being garnished. Well, how much can they take from my bank account under garnishment? Here’s the thing. They can really take all of it. So imagine that. You have money in your bank account, and it all gets wiped out. So what do you do? What about checks you’ve written? Well, those checks are going to be bouncing. What about checks you need to write? What about the money you need from that account to live on? It’s gone. It’s been garnished. This is a question that a lot of people get wrong. And by getting this wrong, they end up doing nothing. Because they assume, well, Portfolio sued me. LVNV sued me. Midland Funding sued me. So, therefore, the debt collector must own the debt. That is what the debt collector is alleging. What they’re claiming. But now they have to prove it. It’s one thing to claim something. I may not be the President of United States of America. So just because somebody says something does not mean it’s true. In the lawsuit against you, the debt collector is making claims such as they allege they own the debt. Well, they have to prove it, unless you default. So don’t let that happen! Don’t let the collector off the hook by defaulting – instead make the collector prove it owns the debt and every other part of its lawsuit. This goes all the way back to a blog post I wrote I think in 2006 or 2007 about this. And it was an incredibly popular blog post because I think maybe we were the first or one of the first to really recognize this distinction. So let me give it to you this way. The debt collector in a lawsuit, in a trial, is going to focus in on that you owe the original creditor. Let’s say the original creditor is Synchrony Bank. You see a lot of consumers and even lawyers go, “Well yeah, I guess they did. They proved I owe the debt.” But here’s the thing. Do you owe that debt to Midland Funding? To LVNV? To Portfolio? That’s the question. So let me give you an example. I owe money to my mortgage company. No question about it. So can you sue me for the money I owe my mortgage company? Yeah, I’m thinking not unless you own that mortgage now. So it’s not enough to show I owe somebody money. The debt buyer must show I owe that company the money. And they show this by proving they own the debt. So it is mission critical to understand there is an absolute difference between owing a debt, and the debt collector owning the debt. They can prove you owe the debt and they can still lose. As a matter of fact, that is true of virtually all the cases we’ve had – just hundreds and hundreds and hundreds of cases. Yes, we owe the debt but do we owe it to LVNV or Portfolio or Midland Funding? No. Because they have to prove they own the debt. One last example – this is silly, but I think you’ll get the point. Imagine I witness Bob Smith running a red light and crashing into somebody. Can I sue Bob Smith for the car wreck? Now, I can prove Bob Smith ran the red light. He was negligent. He was careless. And he violated the safety rules. Okay? We do this all the time in our personal injury cases. Same thing in, for example, a credit card context. They can prove you owe Bank of America, Chase, Synchrony Bank, Capital One. But if this is a debt buyer that is suing you, then the debt buyer must prove it owns the debt. So always remember that very critical distinction. No. Unless the debt buyer can prove it owns the debt. Otherwise, it’s just some stranger. Remember my example of I owe my mortgage company, but that does not mean I owe you. Or maybe I run a red light, that doesn’t mean you can sue me unless you were involved in the wreck. So just because you owe this whole credit card debt does not mean you owe it to the debt buyer, unless the debt buyer can prove it owns the debt. I know I’m really stressing this point but it is absolutely mission critical to understand this. When you understand this, it puts you ahead of 99% of consumers who are sued in Alabama. Now, here’s one that it surprised me the first time I was asked this, but I’ve been asked a number of times, so I want to put it in here. Does the collection lawyer have to prove that he or she owns the debt they’re suing me on? No. The collection attorney does not have to prove that the lawyer owns the debt. What the lawyer has to do is prove that the plaintiff, the debt buyer who is suing you owns the debt. Well if you see that the law firm is Nathan & Nathan. They are not saying that they own the debt. And if for example, they’re suing you for Capital One. They’re not saying, “We bought the debt from Capital One.” They’re saying, “Hey, we represent Capital One.” So the collection lawyer is merely representing the debt buyer or the debt collector. Just like you can hire a lawyer to represent you in court – this is one of your options we will discuss later in this book. The collection lawyer has to prove the plaintiff, the company that sued you, owns the debts. Not that the collection lawyer owns it. The answer is, we want to know what is the original creditor saying about dates of payment, the last payment, because that can have a big impact on the statute of limitations. We also want to know what is the amount that the original creditor says you owe? What is the amount that the debt collector says, the debt buyer? What are the dates they put on your credit report? A lot of times we can find contradictory information which then is very useful for trying the case. So for example, Portfolio Recovery Associates says something about the amount, or the dates of payment, etc in the lawsuit, but then in your credit report, they or the original creditor say the opposite of that. That’s good for you and bad for them. And they’ve got some explaining to do when they have these contradictory things. So that’s why it’s important to look at your credit reports. Now you can pull your credit reports for free through www.AnnualCreditReport.com. You can see how to download your credit reports. You can also find the phone number to call or you can also mail in a short form to get it mailed to you. If you have any problems or questions about that, just give us a call. But that’s the way to do it for free. It’s a 100 percent free. You’re not putting in your credit card. You’re not signing up for a monitoring service. This is the legitimate way to get your actual credit reports for free. So that’s what we have recommended for many years to go to www.AnnualCreditReport.com to pull your credit reports. I recommend that you also pull your Innovis credit report as it may have information that is helpful also. You can do so at https://www.innovis.com/creditReport/index and you should also pull your Sagestream credit report at https://www.sagestreamllc.com/consumer-report/. Let’s take a step back and see the next step in the big picture. After the debt buyer has sued you, it will try and serve you with the lawsuit. Or hand you the lawsuit. After you’ve been served, the clock starts running for you to answer or respond to the lawsuit or the debt collector will get a default judgment against you. Finally, you will go to trial. But let’s start with being served. We will pick up with part two in our next article in this series — being served with the collection lawsuit. Part three is going over your five options when sued. Part four covers the option of bankruptcy. 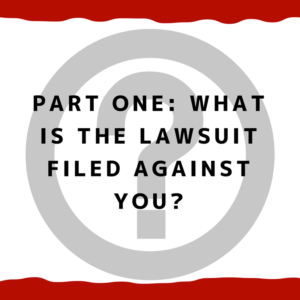 In part five we talk about the option of you fighting the lawsuit on your own without hiring a lawyer. In part six — we cover settling the lawsuit on your own. Part seven covers hiring a lawyer to fight the lawsuit for you. Part eight is hiring a lawyer to settle the lawsuit. In part nine we cover what is an Answer and how to do you file it. Part ten is about what happens in court before the trial. Part eleven is where we discuss general questions about trials regardless of which court the trial is in. In part twelve, we focus on small claims court trials. Part thirteen, we turn our attention to trials in district court. When we get to part fourteen — this deals with trial in circuit court. Part fifteen helps us understand what happens after a trial in small claims or district court. PS — If you want to watch the entire video (over two hours and answering more than 150 questions), you can find it here on our Youtube channel. You may also want to get our checklist to use when you have been sued by a debt collector in Alabama — it is free for you to download.